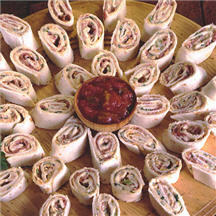 Wrapped tortillas filled with tasty chipped beef are great for parties. Combine cream cheese, 1/3 cup Cheddar cheese, lime juice, chili powder and cumin in medium bowl; add Creamed Chipped Beef, cilantro and green onion, stirring well. Evenly divide mixture among tortillas, spreading to cover each tortilla. Roll up each tortilla, finishing with seam-side-down. Place rolled tortillas on baking sheet; sprinkle with 1/4 cup Cheddar cheese. Bake in preheated 400°F (205°C) oven for 7 minutes or until cheese is melted. Let stand 3 to 5 minutes; slice into 1-inch pieces and serve hot. *Defrost creamed chipped beef in microwave on 50% power for 5 to 6 minutes. Tip: Recipe can also be prepared without baking. Omit cheese topping; refrigerate filled and rolled tortillas for at least one hour to set filling before slicing.